PRODUCT DESCRIPTION: IF you are planning to go on an adventure then we have something that you must keep in your backpack. Our rechargeable adjustable focus LED headlamp. With three lightening modes, you can choose the one that fits your need. With the gesture control, you don't have to search for a button as you can simply wave your hands to turn the light on and off. Its waterproof design enables you to take this light anytime anywhere with you. Our rechargeable headlamp uses standard 18650 batteries for power. The rechargeable headlamp will give you 1.5 hours of light in a single charge. If you need more light time, you may buy 18650 batteries set (easily available). This makes it easier for you to extend time or change batteries in case they die. Main light includes a focus adjuster to adjust light focus as per your needs. You can set this light to focus on a single spot or spread the light in wide angles. Made under strict quality controls, every effort has been made to maintain highest quality standards during the entire manufacturing process. Each and every product you receive from us is tested before dispatch to ensure you get the premium quality product that you have paid for. GESTURE SENSOR - Front mounted gesture sensor can sense your hand movements and when you shake your hands in front of the sensor, it can turn on the lamp for you. Shake your hands again and it will turn the headlight off. 3 MODE LIGHTS - Out rechargeable head lamp comes with three different lightening modes i.e. main light only, side lights only and all lights. Choose the mode according to your needs. ADJUSTABLE FOCUS - Adjustable focus allows you to adjust this headlamp according to your own needs. You can change focus to make this light focus on one spot or spread the light around in wide angle. WATERPROOF DESIGN - With waterproof design, you can use this headlamp under water or in the heavy rain. No matter where you go, your headlamp is all weather friendly device. ADJUSTABLE HEADBAND - With adjustable headband, you can adjust the headband to your own size and use it comfortably. Be worry free as this rechargeable headlight is fully customizable. SOCKET AND WALL CHARGER INCLUDED - Comes with a included wall socket or car charger to charge your rechargeable LED headlamp anytime anywhere you want to. These two charges will keep your headlamp always fully charged and ready for adventure. 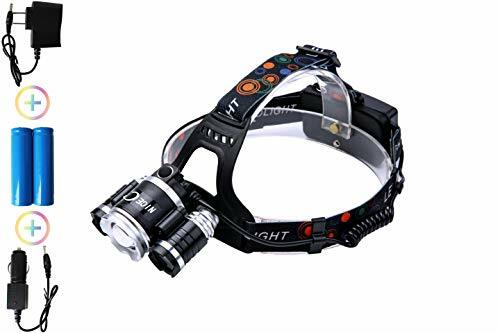 MULTIPLE USES - You can use our head flashlight on any outdoor activity such as camping, work, night riding, hiking, running, adventure, backpacking or any other activity that requires you to have a powerful light. If you have any questions about this product by NiceC, contact us by completing and submitting the form below. If you are looking for a specif part number, please include it with your message.